This development designed for Jalcon Homes in Hobsonvile Point consists of 14 houses on a small coastal peninsula. 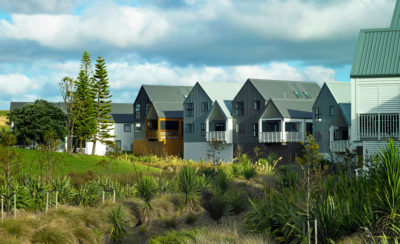 The site has a coastal edge and public walkway on three sides with seaside ecology and associated views of the upper Tamaki Harbour to the North West, and a busy urban road to the South.The proposed architecture is contemporary in style, drawing inspiration from coastal boathouse typologies. 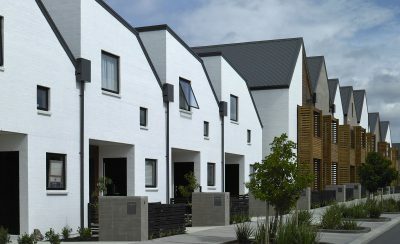 The complimentary gable roofed building types form a visually coherent and unique new neighbourhood, yet the various designs fit neatly into the overall Hobsonville neighbourhood context. 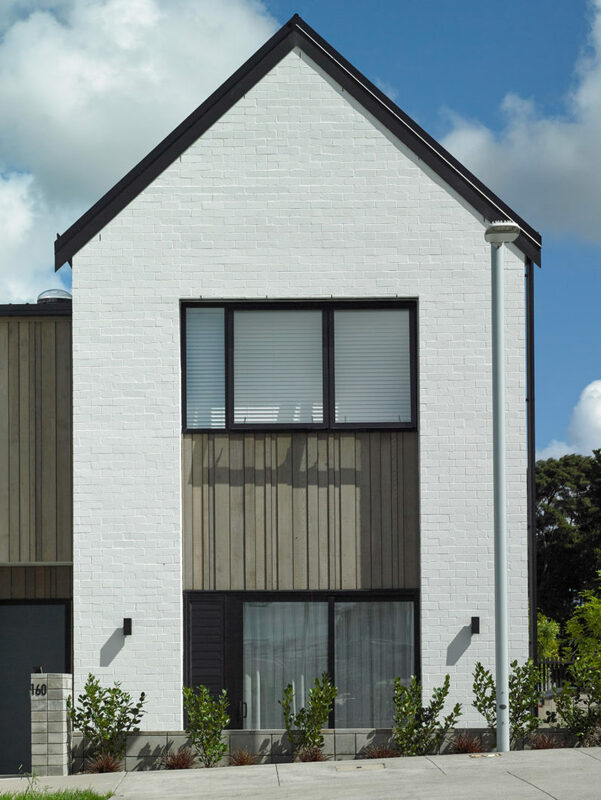 The timber, brick, and weatherboard materials used are honest, unadorned and low maintenance. The brief called for homes that Jalcon could afford to build and sell in a very competitive market, with all 14 houses selling well before completion. Carefully considered design was required to create elegant homes, with interesting interiors that were economical and financially viable. We felt that this seaside edge required a cohesive architectural response, a composition synthesizing repetitive and variable elements into a complex and intriguing whole, with a combination of both formality and informality. 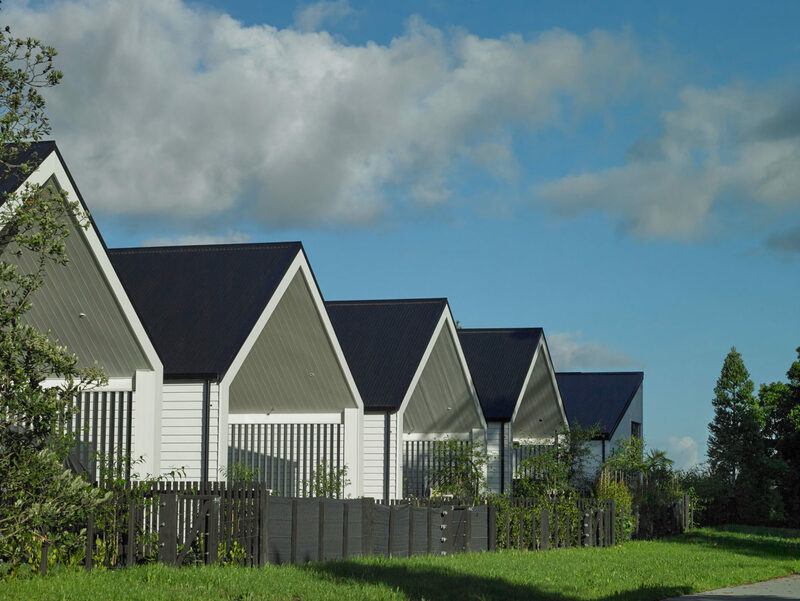 The proposed designs allow for four differing housing plans across 14 dwellings that respond individually to the topography of their immediate surroundings as well as having a complimentary palette of cladding materials that link the enclave of dwellings. The site’s asymmetric shape, coast, road and internal laneway boundary conditions have inherently led to a variety of design responses to each location. As a result every view is different both as you approach the site and journey through the internal laneways. The architecture as a whole has layers of informality found through the playful placement of random sized windows, stepped facades and varying roof-lines. The end result is a satisfying new neighbourhood promoting thoughtful architecture in a demanding developer led multi-residential market.